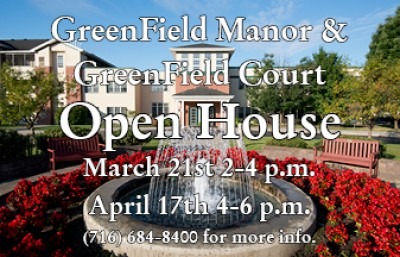 Join us at 5953 Broadway in Lancaster for our open house on Wednesday, March 21st from 2-4 p.m. or Tuesday, April 17th from 4-6 p.m. Tour our remodeled residential apartment homes at GreenField Manor and our assisted living apartments at GreenField Court. More information on memory care and enhanced assisted living at GreenField Terrace will also be available. Call (716) 684-8400 for more information.